Josephine “Jo” Veronica Dvorak, age 86, passed away on Friday, December 23, 2016 at Bethany Nursing Home in Sioux Falls, SD. She was born in Tyndall, SD on September 13, 1930 to Hattie (Bambas) and Frank Vellek. She had 4 siblings: Mildred Smith (deceased), Violet Watkins (deceased), Ervin Vellek (deceased) and Bonnie Reinesch. She grew up on the family homestead outside of Tyndall, SD and as a young woman she attended school and worked on the family farm. She married Norman Dvorak (deceased) on September 12, 1953 at St. Joseph Cathedral in Sioux Falls. Together they were loving parents to 6 children: Brad Dvorak, Andrea (Al) Rausch, Chris (Tom) Dvoracek, Matthew Dvorak (deceased), Ted Dvorak, and Rick Dvorak. She is survived by 8 grandchildren, 10 great-grandchildren and 2 great- great-grandchildren. 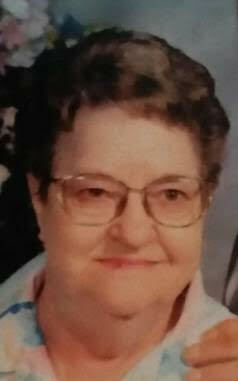 Jo enjoyed gardening and canning, flowers, baking, playing Bingo, coffee parties with neighbors, and playing cards and games with family and friends, She is remembered by her children and grandchildren for her life quotes, cooking, and hospitality to friends and family. Visitation will be Friday, December 30, at Barnett-Lewis Funeral Home with family present from 5-8 PM. A private burial will be held at St. Michael Cemetery.